^ Berger, Lee R. (2006-10-01). 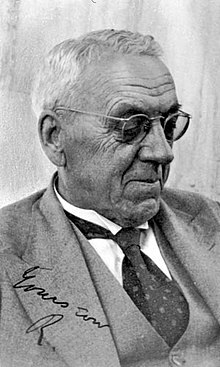 "Brief communication: Predatory bird damage to the Taung type-skull of Australopithecus africanus Dart 1925". 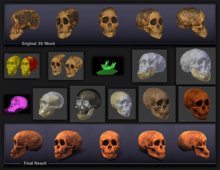 American Journal of Physical Anthropology. 131 (2): 166–168. doi:10.1002/ajpa.20415. ISSN 1096-8644. PMID 16739138. Brain, C.K. 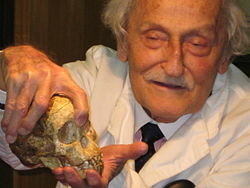 (2003), "Raymond Dart and our African Origins", in Laura Garwin and Tim Lincoln, eds., A Century of Nature: Twenty-One Discoveries that Changed Science and the World, pp. 3–9, ISBN 978-0-226-28413-2. CS1 maint: Uses editors parameter (link) ISBN 0-226-28415-8 (paperback). Reed, Charles (1983), "A Short History of the Discovery and Early Study of the Australopithecines", in Kathleen J. Reichs (ed. 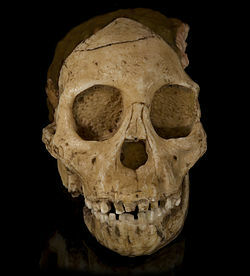 ), Hominid Origins: Inquiries Past and Present, Lanham, MD: University Press of America, pp. 1–77, ISBN 978-0-819-12864-5. CS1 maint: Extra text: editors list (link) ISBN 0-819-12865-1. 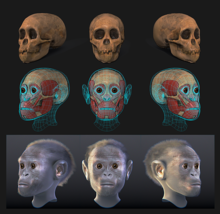 Štrkalj, Goran; Kaszycka, Katarzyna (2012), "Shedding new light on an old mystery: Early photographs of the Taung Child", South African Journal of Science, 108 (11–12): 1–4, doi:10.4102/sajs.v108i11/12.1224. 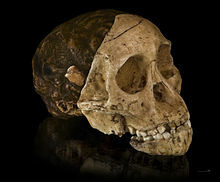 "Images of Taung 1". Retrieved 2006-07-13.